This page contain Canon iPF6300, 6350 and 8300 initial release info. We now have an iPF8300 page devoted to our new printer, with articles and links to further info. This follows on from our full Canon iPF6300 review. The replacements for Canon’s iPF6100 and others. 12 colour printers with new Lucia EX inks. 17th After a month of testing the 6300, I hope to have our full review published on the site in a week or so. 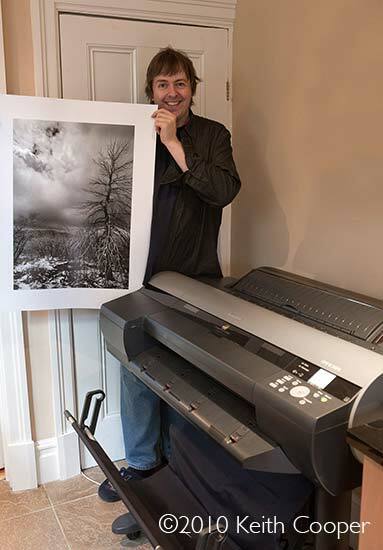 The picture of me holding one of my prints (right) was taken for an upcoming magazine article, where I was interviewed about my thoughts on the printer. The review will be a long one, but the gist of it is that this is one of the best quality printers I’ve looked at yet. I’ve a few minor quibbles, but it’s a well designed printer. The print plugin had a few colour management issues on the 6100, but it appears that it has been redesigned to be much more useful for high end printing. 8th – No UK announcement news yet. Meanwhile, in the UK, Canon still have the iPF6100 and 8100 on display at the Focus trade show – no news of an official UK announcement yet, but that does mean there are some very good deals available on the 6100/8100 at the moment in the UK. 10th It seems that the announcement and availability dates were -only- for Japan. How long it’ll be until we hear from other parts of Canon is an open question at the moment. 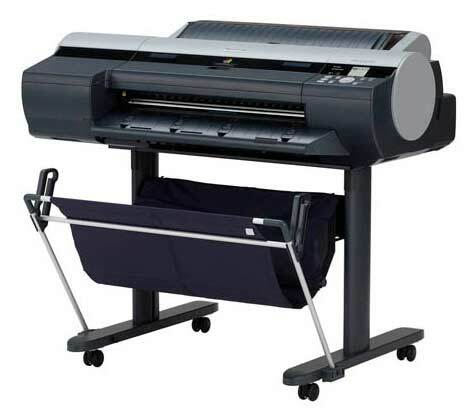 LAKE SUCCESS, N.Y., February 17, 2011 – Canon U.S.A., Inc., a leader in digital imaging, today announced two new large format printers – the 44-inch imagePROGRAF iPF8300S and 24-inch imagePROGRAF iPF6300S. 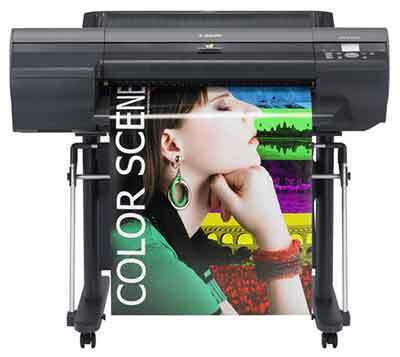 These two 8- colour large format printers feature similar technology found in the award-winning 12- colour iPF8300, iPF6350 and iPF6300 printers, including Canon’s LUCIA EX ink set. These new additions to the imagePROGRAF lineup broaden Canon’s offering to the graphics arts, photo and production markets by setting a new standard for the category by providing an optimal balance of high productivity and exceptional print quality. The new imagePROGRAF models will be showcased at the Wedding & Portrait Photographer International (WPPI) Convention at the MGM Grand in Las Vegas, February 21-23, 2011 in the Canon booth, number 401. With Canon LUCIA EX pigment ink, professionals can achieve high quality and performance in such printing applications as colour or monochrome photography, industrial design and high-quality poster production. The new 8- colour system, utilized by both models, covers a reproducible colour gamut which has been expanded approximately 20-percent beyond previous S-series models. With its new pigment materials and structure, Canon’s LUCIA EX ink set achieves greater shadow details, deeper black density and overall scratch resistance. This ink system works in conjunction with the high-density PF-05 print headfeaturing Canon’s FINE (Full-photolithography Inkjet Nozzle Engineering) technology with 2,560 nozzles for each color: cyan, magenta, yellow, black, matte black, photo cyan, photo magenta and gray. 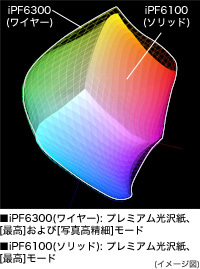 An additional feature found in the new imagePROGRAF models is a built-in colour calibration function which compensates for colour variations caused by factors such as age and environmental affects, enabling consistent colour representation across multiple large-format printers or when printing multiple copies. 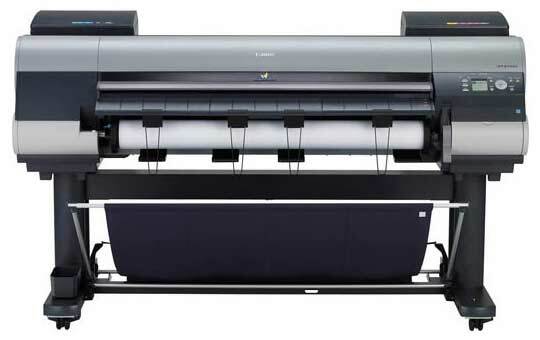 Two important attributes users look for when making the decision to purchase a large format printer are high-quality output and overall speed. With new Fast and Economy print modes, speeds can be achieved up to twice as fast as current 8- colour models, helping to enhance overall productivity while also reducing ink consumption by approximately 50 percent. 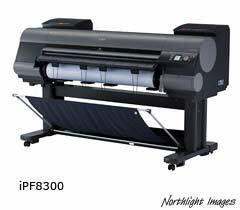 The iPF8300S can produce a B0-sized (39.37” x 55.67”) output in approximately 80 seconds while the iPF6300S can deliver an A1-sized (23.39” x 33.11”) document in roughly 35 seconds. The new S-series printers have doubled their hard drive capacity compared to earlier models now with 160 GB, making it possible to reprint the required number of copies at any time with or without a computer. When working on a project in the photo lab, studio or agency it is important to have images printed as good if not better than when first captured. Helping to make this process a little easier is the inclusion of a print Plug-In for Adobe Photoshop providing further support for the proofing, photo and 64-bit printing environment. When edited in Photoshop, 16-bit Adobe RGB images can be processed directly to the machines preserving the images wide gamut and smooth gradation. There is also a print plug-in provided for Digital Photo Professional allowing for direct printing of high-quality RAW images helping to preserve overall image quality. 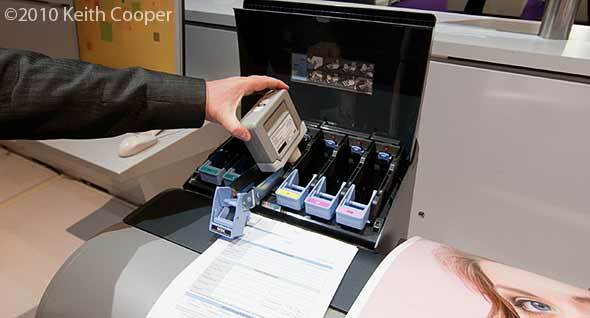 Additional software included in the box is Canon’s Accounting Manager and PosterArtist Lite software. The 44-inch Canon imagePROGRAF iPF8300S will have a manufacturer’s suggested retail price (MSRP) of $4,995 while the 24-inch imagePROGRAF iPF6300S will have an MSRP of $2,995. 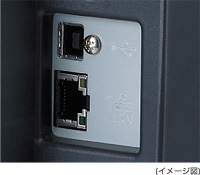 * Both models are expected to begin shipping in April 2011. LAKE SUCCESS, N.Y., February 22, 2010 – Canon U.S.A., Inc., a leader in digital imaging and advanced office solutions, today answers the increasing demand for large format prints in the photographic, proofing and graphic arts market with the introduction of three new imagePROGRAF large format models – the 44-inch imagePROGRAF iPF8300, 24-inch imagePROGRAF iPF6350 and the iPF6300. Designed for precise, ultra high-quality print performance and increased productivity, each model features Canon’s new, 12-Colour LUCIA EX pigment ink set and advanced printing technologies specifically developed to produce prints with an enhanced colour range and improved durability. The new imagePROGRAF models will be unveiled at the Wedding & Portrait Photographer International (WPPI) Convention at the MGM Grand in Las Vegas, March 8-11, 2010. With increasing consumer demand for professional and high-quality print jobs, high-end graphic and photographic studios continue to seek the capability to accurately produce vivid output of consumers’ most demanding projects. To enhance its available colour spectrum, the new imagePROGRAF models feature a revolutionary all-new 12-Colour LUCIA EX pigment ink set increasing the achievable colour gamut by approximately 20 percent from the previous imagePROGRAF iPFx100 series and enabling over 90 percent coverage of PANTONE (*) colours to produce rich expression. Additionally, to better meet the needs of the professional print market, the new models feature a reinforced mechanical structure to enable precise ink placement for improved text and line accuracy, making these new devices a powerful proofing solution. The introduction of the new LUCIA EX ink provides photographers with the ability to precisely achieve their desired results by producing more expressive and crisp blacks, smooth colour gradations, and the capability to reproduce the finest details in the shadow areas of photographs. The new inks are also designed with an innovative polymer structure that results in greater scratch resistance and protection from colour fading, while also reducing bronzing and metamerism ensuring durable, stable output. 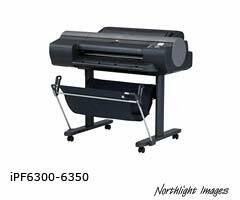 To expand print options and improve proofing capabilities, the iPF8300, iPF6350 and iPF6300 come bundled with a new Print Plug-In for Photoshop, Digital Photo Professional and support for Adobe Colour Management Module, enabling features such as Black Point Compensation. Through the Photoshop Plug-In, each new model allows 16-bit RGB images edited in Photoshop to be sent directly to the imagePROGRAF printers, preserving smooth and high gradation. n order to support high-volume printing and streamline workflows the Canon iPF8300 and iPF6350 come equipped with an 80 GB high-capacity hard disk drive (HDD) that allows for faster spooling of large files as well as the ability to reprint jobs directly from the printer. To ensure the highest level of productivity and reduce overall print time, all new models are also equipped with a standard gigabit Ethernet network interface and an automatic dual-blade cutter. To fully capitalize on the dynamic colour range of the new LUCIA EX ink set, each new imagePROGRAF model employs two advanced one-inch print heads, each featuring 2,560 nozzles per colour and outputting a super fine four picoliter (pl) droplet at a full 2400×1200 dots-per-inch resolution (dpi) to reproduce details with extraordinary accuracy and clarity. Paired with enhanced plug-ins and new, High Precision Printing Modes, these new imagePROGRAF models provide an extremely high level of photographic and proofing quality prints. TOKYO, February 1, 2010 – Canon Inc. and Canon Marketing Japan Inc. announced today the introduction to the Japanese market of three new imagePROGRAF-series large-format inkjet printers: the imagePROGRAF iPF8300, capable of producing B0+ (44 inch wide) output, and the iPF6350 and iPF6300, both capable of producing A1+ (24 inch wide) output. Ideal for graphic applications and colour proofing, the new lineup achieves a level of performance essential for professional users. Featuring an enhanced printer carriage with increased precision and rigidity, the new Canon imagePROGRAF iPF8300, iPF6350 and iPF6300 deliver improved ink ejection accuracy. The enhanced frame structure realizes crisp black text as well as sharp white knockout text, higher line and text precision, enhanced colour representation and uniformity, and superior gloss homogeneity for improved resolution and graphical consistency in proof printing. In addition, the trio offers a wider colour gamut with over 90% coverage of Pantone(*) colours to realize rich colours expression. The Canon imagePROGRAF iPF8300, iPF6350 and iPF6300 allow users to establish a tailored proofing system from a range of usage applications. In addition, all of the new models support RIP’s released by such major venders as GMG, CGS, EFI, and ONYX to further support a range of print applications such as proofs, designs, and commercial photos, allowing designers, photographers, and other professional users to print without changing preferred workflows. The new Canon imagePROGRAF lineup features a colour calibration function that utilizes an internal high-performance multi-sensor to precisely detect, adjust and compensate for variations in density among print heads, realizing stable colour reproduction and accurate colour matching. The colour calibration function is easily accessible through the printer operation panel and the entire calibration process can be completed in a short ten minutes. 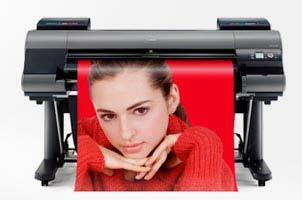 The new imagePROGRAF iPF8300, iPF6350 and iPF6300 utilize Canon’s proprietary twelve-colour ink system, LUCIA EX, and feature an enhanced pigment colouring formulation in combination with newly developed image processing technology. The enhanced system covers an area on the colour gamut up to approximately 20% larger than previous models to realize improved colour reproduction. Furthermore, the new imagePROGRAF models achieve not only richer and sharper black expression and accurate reproduction of the details and subtle shading of dark areas, but also further reduce the occurrence of “bronzing,” a phenomenon in which printed colours take on a metallic hue depending on the angle at which they are viewed. 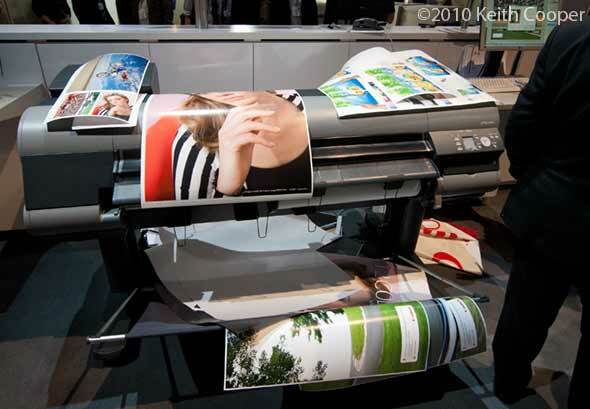 The new Canon large-format inkjet printers utilize a newly developed image processing technology that accurately converts RGB data into ink colour during printing, as well as the capability of fine-tuning colours and retouching images on Adobe Photoshop before printing to produce a level of accuracy and quality essential for professional photographers and creators. The Media Configuration Tool included in all three new imagePROGRAF models allows the adjustment, registration, and distribution of various parameters of third-party media. This tool also makes possible safe and effortless printing and proofing when using non-Canon brand media to allow users to maintain their preferred workflows and settings. Canon’s new imagePROGRAF lineup features inks with enhanced scratch resistance that deliver increased protection from external scratches through the addition of a slipping material that lowers the coefficient of friction in conjunction with a polymer added to strengthen the bond in the ink layer. In addition, the imagePROGRAF iPF8300 and iPF6350 incorporate a large-capacity 80GB hard disk drive that allows users to save job data even during print jobs to quickly free up the PC providing the source data, and also supports smoother job recoveries in the event of an error by doing away with the need to resend print data from the source PC. This is a summary of a release issued in Japanese by Canon Inc. and Canon Marketing Japan Inc. in Tokyo on February 1, 2010.